Dr. Thomas J. Saporito (Chicago) Ed.D., is chairman and CEO of RHR International. 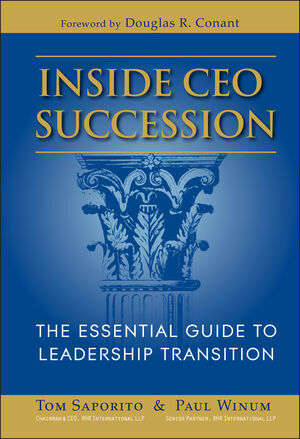 Widely recognized as an expert in CEO succession, he has specialized over the past 30 years in consulting with CEOs, boards of directors, and senior management on succession planning and top management leadership. He works closely with chief executives and senior management on accelerating business strategies by strengthening individual leadership and team-based performance. A former member of the NACD Blue Ribbon Commission on CEO Succession, his career has taken him throughout the United States, Europe, and Asia. Dr. Paul C. Winum (Atlanta, GA) Ph.D., is a senior partner with RHR International and serves as global practice leaderCEO Succession. He is a regular contributor to articles published in the Wall Street Journal, Fortune, and Forbes. In 2007, he was awarded specialty board certification in Organizational and Business Consulting Psychology by the American Board of Professional Psychology and was elected as a Fellow of the American Psychological Association.